Background: Abnormal body mass index (BMI) is known to result in serious health consequences. Objective: The present study aimed at determining the pattern and prevalence of underweight, overweight and obesity among market women at Ile-Ife. Methods: The participants had their weight and height recorded by standardised techniques, and BMI was calculated from the weight and height. BMI was classified according to the World Health Organization criteria. The average income per day (AIPD) for each participant was estimated as the average sum of daily profit earned on goods and services. Data were analysed using descriptive and inferential statistics. Results: Nine hundred and three market women participated in the present study. The age range was 18–95 years with 41.7% between 18 and 40 years, 43.0% between 41 and 64 years and 15.3% were 65 years and above. The mean of age and BMI of the participants were 46.3 (15.1) years and 28.5 (5.4) kg/m2, respectively. Only 23.3% of the women had normal BMI. The prevalence of underweight, overweight and obesity was 1.7%, 38.5% and 36.5%, respectively. The distribution of overweight and obesity among age groups 18–40 years, 41–64 years and 65 years and above was 40.6% and 30.2%; 38.7% and 41.7% and 32.6% and 39.1%, respectively. There was a significant association (χ2 = 7.177, P = 0.028) between AIPD and BMI classes. Conclusion: This study showed a high prevalence of abnormal BMI among market women in Ile-Ife. Overweight and obesity constitute a major health burden among market women. Obesity is a medical condition, in which excess body fat has accumulated to the extent that it may have an adverse effect on health, leading to reduced life expectancy and/or increased health problems. Overweight and obesity constitute a global problem, denoted by the World Health Organization(WHO) as ''globesity''. According to WHO, overweight and obesity are defined as body mass index (BMI) greater or equal to 25 and 30 respectively. WHO fact sheet on overweight and obesity showed that in 2014, 39% and 13% of adults aged 18years and above were overweight and obese respectively while worldwide obesity has more than double since 1980. In Australia, the prevalence of obesity among adults has increased from 11.1% in 1995 to 16.4% in 2004–2005, and this upward trend is predicted to continue over the upcoming decades. Underweight, overweight and obesity have been linked to several morbidities and are, therefore, considered as abnormal or unhealthy body weight. Studies have shown that abnormal BMI (underweight, overweight and obesity) occurred more in females than male participants.,,,, The nutritional challenges faced by developing nations have being compounded by the rising incidence of obesity, a phenomenon attributed to the so-called nutritional transition., In Nigeria, adult obesity has being reported to have reached an epidemic level constituting a major health threat., Most of the studies done on obesity are for general population,,,,,, but this study aimed at the prevalence of underweight, overweight and obesity among market women in South-West Nigeria because these set of people are prone to sedentary lifestyle in the course of their occupation. The study took place at Ife New Market located in Ile-Ife, Osun State. A total number of 903 market women participated in this study, none of them reported to be pregnant. All participants freely gave their informed consent after being informed about the purpose of the study. The average income per day (AIPD) for each participant was estimated as the average sum of daily profit earned on goods and services. Measurements were taken using standardised equipment. Height of all participants was measured using a stadiometer in standing position without footwear and headgear to the nearest 0.1 cm. Weight was measured with minimum clothes using a calibrated electronic scale with digital reading to the nearest 0.1 kg in the inner part of their stalls. BMI was determined based on the formula: Weight in kg/height in metres squared. Based on the WHO criteria, the participants were classified as underweight, normal, overweight and obese according to the BMI of <18.5 kg/m2, 18.5–24.9 kg/m2, 25.0–29.9 kg/m2 and ≥30.0 kg/m2, respectively. The participants were also subclassified into two; non-obese (BMI < 29.9 kg/m2) and obese (BMI ≥ 30.0 kg/m2). The results were analysed using descriptive and inferential statistics. Out of 903 market women who participated in this study, 41.7% were within the age range of 18–40 years, 43.0% were in the age range of 41–64 years and 15.3% were in the age range of 65 and above. The mean age was 46.3 (15.1) years. Majority (67%) were Christian, 92.2% were Yoruba ethnicity, 42.6% had been trading in the market for more than 10 years, 23.1% had been trading in the market for between 6 and 10 years and 34.3% had been trading in the market for < 5 years. Nearly, 80.1% had formal education while only 7.6% of the total population had tertiary education. [Table 1] the details of the average daily income of the women per day. This was used in the sub-classification of the women into three categories. The mean (standard deviation) of weight in kilogram, height in meter and BMI (kg/m2) were 71.5 (13.3), 1.6 (0.1) and 28.5 (5.4), respectively. 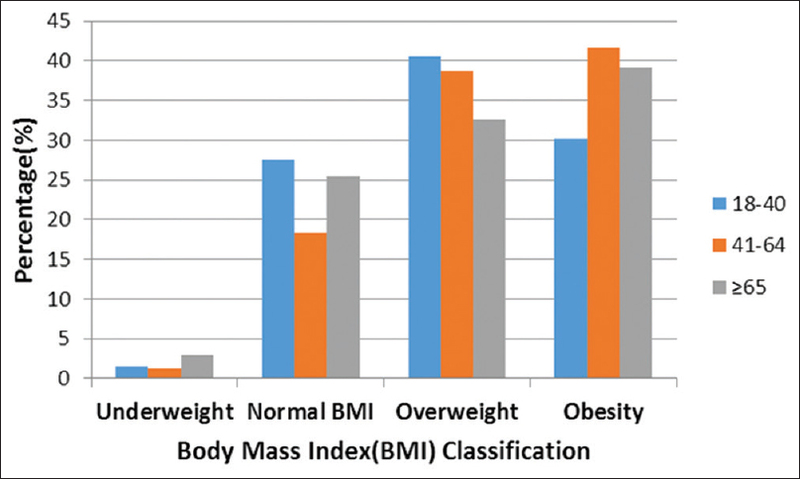 The BMI distribution is as shown in [Figure 1]. Only 23.3% of the total population had normal BMI, 1.7% were underweight, 38.5% were overweight and 36.5% were obese. The prevalence of high BMI (overweight and obesity) was 75%. 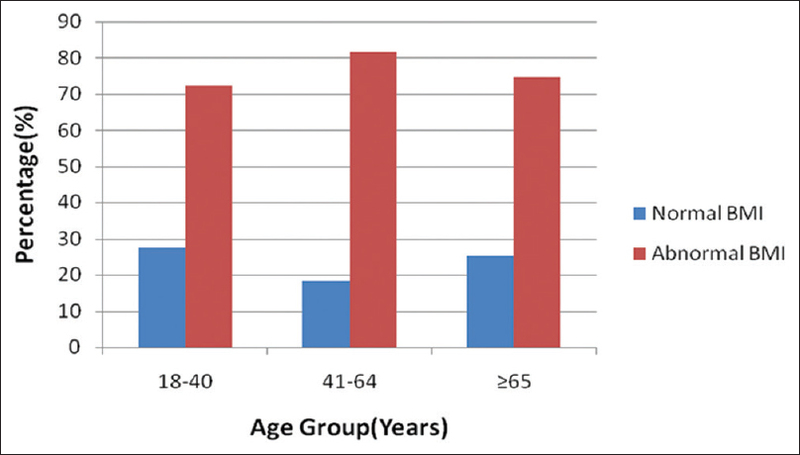 The distribution of BMI across the age groups is shown in [Figure 2], while [Figure 3] illustrates the distribution of age groups across the classes of BMI. There was a significant association (χ2 = 7.177, P = 0.028) between AIPD and BMI classes [Table 2]. This study provided an insight into the prevalence of underweight, overweight and obesity among market women in Ile-Ife, South-West Nigeria. Data in the aspect of research are sparse in Nigeria. It was disturbing that the prevalence of abnormal BMI among this group of women was extremely high. This prevalence was far higher than the results of most studies in Nigeria. Among general population of adults, a prevalence of 51.1% had been reported at Usmanu Danfodiyo University, Sokoto, Nigeria, while a prevalence of 38.2% had also been reported from another study in suburban Northern Nigeria. Among the female adult population from South-West Nigeria, a prevalence of 36% was reported in Ota, Ogun State. Adedoyin et al, 2009 reported a high prevalence of obesity among residence of Ile-Ife. The high prevalence of high BMI in this present study was in agreement with the relatively good socioeconomic status of these women because majority of the participants who were obese earned above ₦1200 daily. The high prevalence of elevated BMI of 75% in the study population was higher than that obtained in suburban Northern Nigeria and Accra, Ghana, where a prevalence of 50% and 70.2%, respectively, was reported among adult female population. In addition, a prevalence of 69.45% and 50% of abnormal BMI was reported among adult female population in Multan City of Pakistan and Punjab in India, respectively. Among the young adult female population, abnormal BMI was 72.4% in this study. This value was higher than the prevalence of 32.4% and 36% reported among young female adults at Obafemi Awolowo University, Ile-Ife, and residence of Ota, Ogun state, respectively. The high prevalence of overweight and obesity among market women may be related to their economic status. The study showed that most market women (72.9%) earned far and above the AIPD of minimum wage earner in a Nigerian Federal Civil Service. Other reasons to explain the high prevalence of overweight and obesity may include sedentary life style, diet and genetic predisposition. This study showed a high prevalence of abnormal BMI among market women in our environment. Overweight and obesity constitute a major health burden among market women. Haslam DW, James WP. Obesity. Lancet 2005;366:1197-209. World Health Organization. Controlling the Global Obesity Epidemic; 2003. Available from: http://www.who.int/nutrition/topics/obesity/en/. [Last accessed on 2016 Jul 18]. World Health Organization. Obesity and Overweight. Fact Sheet No. 311. Available from: http://www.who.int/mediacentre/factsheets/ fs311/en/. [Last updated on 2016 Jun, Last accessed on 2016 Jul 18]. Australian Bureau of Statistics National Health Survey: Summary of Results. ABS Cat. No. 4364.0. Canberra: ABS; 2004. Walls HL, Magliano DJ, Stevenson CE, Backholer K, Mannan HR, Shaw JE, et al. Projected progression of the prevalence of obesity in Australia. Obesity (Silver Spring) 2012;20:872-8. Flegal KM, Graubard BI, Williamson DF, Gail MH. Excess deaths associated with underweight, overweight, and obesity. JAMA 2005;293:1861-7. Chinedu SN, Emiloju OC. Underweight, overweight and obesity amongst adults in Ota, Nigeria. J Public Health Epidemiol 2014;16:235-8. Bakari AG, Onyemelukwe GC, Sani BG, Aliyu IS, Hassan SS, Aliyu TM. Obesity, overweight and underweight in suburban Northern Nigeria. Int J Diabetes Metab 2007;15:68-9. Puepet FH, Zoakah AI, Chuhwak EK. Prevalence of overweight and obesity among urban Nigeria adults in Jos. Highland Med Res J 2002;1:13-6. Onyechi UA, Okolo AC. Prevalence of obesity among undergraduate students, living in halls of residence, University of Nigeria, Nsukka campus, Enugu state. Anim Res Int 2008;5:928-31. Nkwoka IJ, Egua MO, Abdullahi M, Sabi'u A, Mohammed AI. Overweight and obesity among staff of Usmanu Danfodiyo University, Sokoto, Nigeria. Educ Res 2014;5:290-5. Durazo-Arvizu RA, Luke A, Cooper RS, Cao G, Dugas L, Adeyemo A, et al. Rapid increases in obesity in Jamaica, compared to Nigeria and the United States. BMC Public Health 2008;8:133. Popkin BM, Doak CM. The obesity epidemic is a worldwide phenomenon. Nutr Rev 1998;56(4 Pt 1):106-14. Akpa MR, Mato CN. Obesity in Nigeria: Current trends and management. Niger Med Pract 2008;54:11-5.
WHO. World Health Organisation (WHO) Expert Committee: Physical Status: The Use and Interpretation of Anthropometry. Report of a WHO Expert Committee, Technical Report Series, No. 854. WHO, Geneva; 1995. Akarolo-Anthony SN, Willet WC, Spiegelman D, Adebamowo CA. Obesity epidemic has emerged among Nigerians. BMC Public Health 2014;14:455. Adedoyin RA, Mbada CE, BalogunMO, Adebayo RA, Martins T, Ismail S. Obesity prevalence in adult residents of Ile-Ife, Nigeria. Nig Q J Hosp Med 2009, 19:63-8. Duda RB, Darko R, Seffah J, Adanu RM, Anarfi JK, Hill AG. 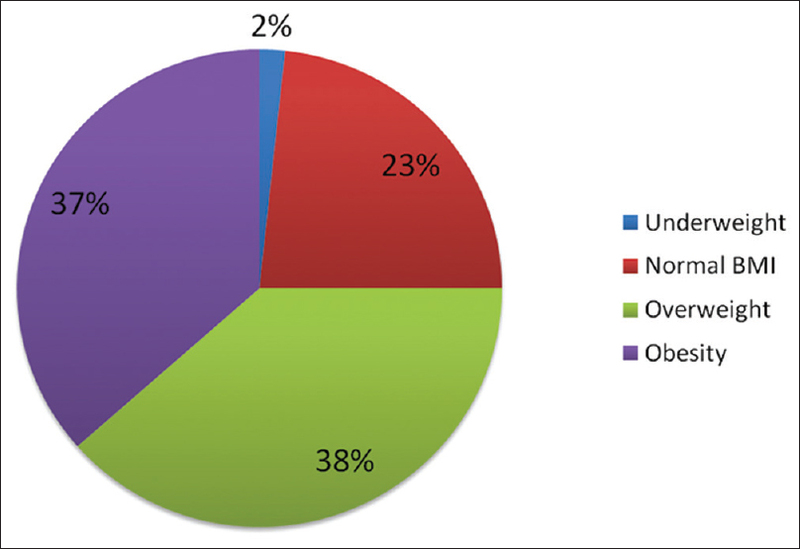 Prevalence of obesity in women of Accra, Ghana. Afr J Health Sci 2007;14:154-9. Aslam M, Saeed A, Pasha GR, Altaf S. Gender differences of body mass index in adults of Pakistan: A case study of Multan city. Pak J Nutr 2010;9:162-6. Shidu S, Tatla HK. Prevalence of overweight and obesity among adult urban females of Punjab: A cross-sectional study. Anthropol Spec 2002;1:101-3. Ogunlade O, Asafa MA. Pattern and prevalence of underweight, overweight and obesity among young adult Nigerians. Am J Biomed Life Sci 2015;3:12-5.